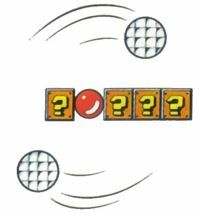 Roto-discs (also spelled Rotodiscs, Roto-Discs or Roto Discs) are Fire Bar-like obstacles that first appeared in Super Mario Bros. 3. Roto-discs are found orbiting gray or red orbs, on which it is possible for Mario or Luigi to stand. Roto-discs are nearly invulnerable; they can only be destroyed if the player transforms into a statue by using the Tanooki Suit and lands on top of one. Duo-Roto-Discs can also be found, which consist of two Roto-discs circling the central orb. If the player destroys one using the Tanooki Suit, the other will disappear. Aside from Super Mario Bros. 3 and its subsequent remakes, the only other appearance of Roto-discs is in the Mini-Mario course in Bowser's Castle in Mario & Luigi: Superstar Saga and Mario & Luigi: Superstar Saga + Bowser's Minions. As a throwback to the previous games, they are obstacles that will send Mario back to the beginning of the area if they connect with him. Super Mario Land contains fiery orb enemies that similarly orbit a block and share the same attack pattern. Super Mario Land 2: 6 Golden Coins also contains an enemy known as a Satellite in the Mario Zone, which behaves in a similar fashion to a Roto-disc. ↑ Super Mario Bros. 3 English instruction booklet, page 38. ↑ Super Mario Bros. 3 Nintendo Power Strategy Guide, pages 9 & 80. ↑ Peterson, Erik. Super Mario Advance 4: Super Mario Bros. 3 Nintendo Power Strategy Guide, page 15. ↑ Super Mario Bros. 3 Nintendo Power Strategy Guide, pages 46, 54, 55, 60, 70. ↑ Super Mario Bros. 3 Nintendo Power Strategy Guide, page 59. ↑ Super Mario Bros. 3 Japanese instruction booklet, page 39. ↑ Shogakukan. 2015. Super Mario Bros. Hyakka: Nintendo Kōshiki Guidebook, Super Mario Land section, page 48. ↑ Super Mario Bros. 3 French instruction booklet, page 44. This page was last edited on March 21, 2019, at 23:26.